Pregnancy products are the products dedicated to deal with the physical changes in a pregnant women during and after pregnancy. Pregnancy period involves many hormonal changes affecting physique, skin, hair, nail and many other parts of a woman body. These products are aimed at minimizing the effects of pregnancy on the women’s physique and is gaining popularity in the large part of the world. Increasing awareness and disposable income in developing nations is expected to drive the demand for the pregnancy products in the developing economies. However, higher prices and side effects of using such products is expected to be key restraint in the growth of the of the pregnancy products dung the period of the study. This report identifies the global pregnancy products market size in for the year 2014-2016, and forecast of the same for year 2021. 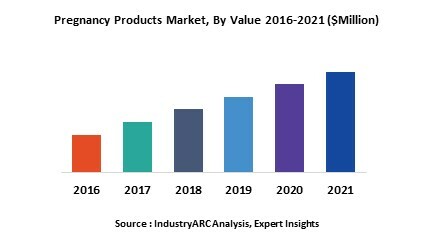 It also highlights the potential growth opportunities in the coming years, while also reviewing the market drivers, restraints, growth indicators, challenges, market dynamics, competitive landscape, and other key aspects with respect to global pregnancy products market. Geographically, North America dominated the pregnancy products market due to higher demand of the pregnancy products in the region due better post pregnancy care, higher awareness about such products and higher disposable income. North America was followed by Europe and Asia-Pacific as the second and third largest markets for pregnancy products. Asia Pacific is projected to have the fastest growth, owing to higher number of expecting mothers, increasing awareness about pregnancy products and rising disposable income the major parts of the region especially in the major regional economies such as India and China in the region. 13.2. Mama Mio US Inc.
13.3. E.T. Browne Drug Co., Inc.